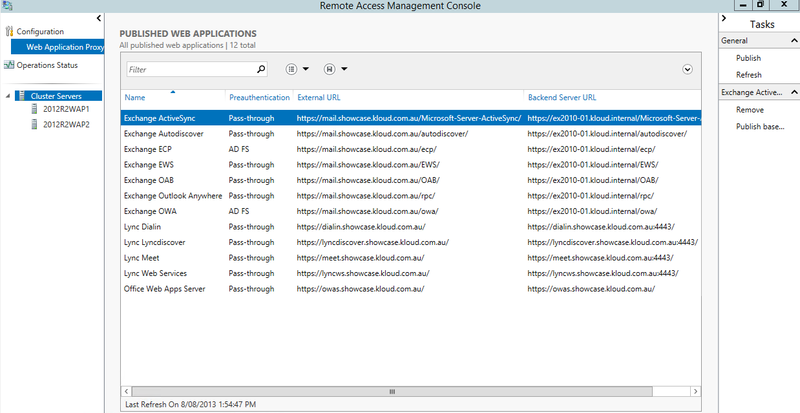 In this post I will be discussing deploying a highly available Windows 2012 R2 Preview ADFS and Web Application Proxy solution using only PowerShell. This was done as a proof of concept to compare the time taken as well as complexity to build and configure a Reverse Proxy solution to replace a UAG 2010 array. Those of you who have worked with UAG will know that just installing and applying UAG updates and Service Packs takes over an hour – before you even get to the application configuration which is totally manual. For a client recently with 6 trunks publishing Exchange, Lync, Office Web Apps, FIM and SharePoint with the same applications published on multiple domain names it would take over 8 hours of mind numbing, RSI inducing and error prone manual input. The configuration I have built here is for Exchange 2013, Lync 2013 and Office Web Apps Server only, but adding SharePoint and FIM would add about 30 seconds to the installation time. The other purpose of these scripts is to get something that is repeatable and easily configurable which gives certainty of the configuration and avoids human error. Note that this is a proof of concept so I have not put in much error checking – all code should be tested in a lab environment. The end result on the ADFS side is an ADFS farm with two servers and a Non-Claims-Aware Relying Party Trust for Exchange. And on the Web Application Proxy side we have a cluster of servers with two ADFS preauthenticated applications and 10 Pass-through applications. In my testing the first ADFS server took on average 2 minutes 15 seconds, the second ADFS server 2 minutes 15 seconds, the first WAP server 2 minutes 45 and the second WAP server 2 minutes 30. That is a total of 9 minutes and 45 seconds for a highly available ADFS and Reverse Proxy solution which is a whole lot better than configuring UAG. Note that I am giving the option of using an internal Certificate Authority for the deployment by specifying ‘-OnlineRequest’ in the scripts. This was done to help me with testing, however in the real world you would use a public certificate on the Web Application Proxy for the publishing rules as well as ADFS. I normally use the same public ADFS certificate on the internal ADFS server to keep the configuration consistent and allow non-domain joined clients and mobile devices connecting via internal Wifi to connect without having to import an internal root certificate. First, a note about the credential prompts. I could have entered the credentials into the script as plain text and converted them to a secure string, but I think that is bad practice as you are dealing with certificates and service accounts where the passwords will not change. Leaving text files with passwords on disk in plain text is a bad thing. Another option is to input the credentials once and save them to the registry in an encrypted form but that is not really relevant here as you will typically run the script only once per server. A third option would be to use remote PowerShell and input credentials once before running the configuration on all servers. Edit the ‘### Variables’ section of each script and run from an elevated PowerShell prompt. $ADFSdisplayName = "Kloud Showcase ADFS 2"
$PfxPasswordADFS = Get-Credential "PFX password" -message "Enter the password for the ADFS PFX certificate"
write-host "No password entered, exiting"
$ADFSuserCredential = Get-Credential $ADFSuser -message "Enter the password for the ADFS service account"
$subjectDomain = $subjectDomain -replace "\*", "star"
write-host -foregroundcolor Yellow "`n`nDuplicate certifcates! Delete all certificates with the subject $CertificateADFSsubject"
$PfxPasswordADFS = Get-Credential "PFX password" -message "Enter the password for the PFX certificate"
$PfxPasswordADFS = Get-Credential "ADFS PFX password" -message "Enter the password for the PFX certificate"
$PfxPasswordWAP = Get-Credential "WAP PFX password" -message "Enter the password for the PFX certificate"
$ADFScredentials = Get-Credential $ADFSadministrator -message "Enter the password for the ADFS service account"
write-host -foregroundcolor Yellow "`n`nDuplicate certifcates! Delete all certificates with the subject $CertificateWAPsubject"
write-host -ForegroundColor Green "`n`nDefault bindings before changes"
$command = "http add sslcert ipport=$SniIPport certhash=$CertificateHash appid=$ApplicationID"
write-host -ForegroundColor Yellow "`n`nAdding Certificate"
write-host -ForegroundColor Yellow "`n`nDefault bindings after changes. Check that $SniIPport exists"
Add the servers to the load balancer, external DNS entries and you should be able to login to OWA and join a Lync meeting. it looks like your scripts will save a lot of time, to get Exchange and Lync external services working. Is it possible to use your scripts without any problems on Servers 2012R2 in different Language Version than english, please? You are publishing Exchange 2013 and Lync 2013, but will it also work if we are using the older Exchange 2010 and Lync 2010? Must I have a look to anything? I have not tried it on different languages. I think most of it will work as the PowerShell cmdlets should be the same but you may hit issues with the functions and netsh command structure. Let me know how it goes. I have done some basic testing with Exchange 2010 OWA and Outlook Anywhere with Windows 2012 R2 RTM which worked. I haven’t tested Lync 2010 – it is just pass through so should work fine. Web Application Proxy and the ADFS farm must be on different hosts. Web Application Proxy requires Windows 2012 R2 ADFS, it will not work with a previous ADFS version. There are ADFS proxies for older versions of ADFS that will provide the ADFS authentication for external clients but they cannot be a reverse proxy. The ADFS farm server will not have an external/DMZ interface – that is what the WAP is for. The WAP server needs to be accessible from the Internet, but this can be a public interface, NAT or via a load balancer. I am very appreciated for your great help. Hopefully you can answer me also this questions. Both Servers, the WAP and the AD-FS must be domain members? Pointing to the internal interface of Lync is to the Lync Director or to the Lync Edgeservers internal IP? Many thanks!! Hi Marc, is it still a requirement to install the ADFS Role on a DC? As most people intend putting their WAP servers in DMZ they will not be willing to put domain joined servers in DMZ so I can see this as been a show stopper. Ok but what’s the benefit of exchange publishing through ADFS then? You authenticate always on the same AD domain, with already local useraccounts.. The ADFS / Web Application Proxy is just doing pre-authentication against the domain controllers in the domain the ADFS server is a member of. If you have a trust in place you can authenticate against domain controllers in another forest. You don’t have to have ADFS / WAP to do it.